You know that coding is important. The skills learned when programming - critical thinking, logic, troubleshooting - have impacts beyond the computer screen. Let's Start Coding kits are a way for students grades 4 - 12 to learn coding and computer science hands-on. And we're committed to helping teachers succeed. We've assembled everything you need to launch a coding program. Here's how it works. Our lessons are designed to fit a 50-60 minute class period and flow just like a class should. YES YES YES. This is a quality product. I just can't say enough. I have been an educator for 25 years. I have to say this is one of the best tools for educating programming available. It educates through every learning mode. There are many ways in which the gratification of learning is achieved. Students will benefit from video tutorials, and written explanations. All the aspects of actual program are the experience. This is a first class product that was undoubtably written by educators and programmers cooperatively. My nine year old daughter was elated. Seeing that joy of learning and how proud she was while showing others her coding. Straight quality. Kits can be reprogrammed an infinite number of times, so one set can be shared between many class periods. If you have two class periods of 25 students each, 25 kits will mean each student has their own kit. Pairing students together to share a kit is also a great idea. We recommend that each student has a role, like 'code typer' and 'hardware builder' or 'documenter' and 'proofreader'. This is a great practice for any age, but particularly useful for students in grades 3 through 5. What language do the kits use? C++ (pronounced see-plus-plus). If that sounds scary or people tell you that's not a beginner coding language, check out our blog post on that topic: https://www.letsstartcoding.com/choosing-a-coding-language/ . In short: we focus on concepts that apply to all languages and avoid oddities that are specific to C++. If I follow your guides, how much teachable content is there? Each lesson is designed to take about an hour to complete. The goal isn't to complete the kit, but to build the baseline skills you need in order to get creative with how you use the kit. Just like with coding, there is always more you can do and build. Who are the kits targeted to? 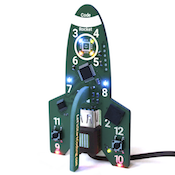 In general, Code Car is designed for kids in grades 3 - 5 and the Circuit Kits (Base and Ultimate) are designed for grades 6 - 12. However, all of the kits are fun for adults to use, and with a little more teacher assistance, younger students can use the Circuit Kits. These are very broad guidelines. Students who have been doing block coding since kindergarten may be ready for the Circuit Kits by 4th grade. A high school senior who has never seen code before may want to start with Code Car. Our lessons are structured to offer enough guidance to absolute beginners and enough 'head room' to let students grow - even professional software developers love our kits! What are the differences between the kits? 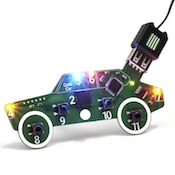 Code Car is a single board that has all of the components built in- the lights, speaker, and buttons are all on one piece. The Code Car lessons are themed around modifying your car- flashing the hazard lights, honking the horn, sounding the siren - and culminate in a fun, multifunctional car. Ultimate Kit is a box of electronics that are plugged together to create custom circuits. Students can add LED lights and a button together, for example, to build a 'flashlight'. Then they can plug in more LED lights to make it brighter. The goal is to introduce the components and coding concepts through examples and lessons, then let the students get creative with their own projects. Base Kit is a subset of Ultimate Kit. It has the basic components your students need to get started. They follow the same step-by-step lessons as the Ultimate Kit, but the kit doesn't include the sensors, LCD screen, or flexible LED Strip like the Ultimate Kit. Is this like a Raspberry Pi / Arduino / Microbit? All of these options are relatively simple computers that can control customizable electronics. 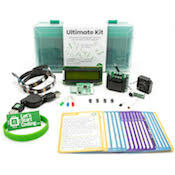 Let's Start Coding kits are simpler to get started with than a Raspberry Pi, but they cannot connect to the internet or bluetooth devices, like Raspberry Pi, some Arduinos, and the Microbit (bluetooth only). The difference you'll find is the Let's Start Coding focus on beginners, including our lesson plans, walkthroughs, and easy-to-understand support materials. Yes. You can visit https://www.letsstartcoding.com/order-for-schools-detail and complete a quote request form. We'll email you a quote, which you can use to create a P.O. . Mail or email us the purchase order and we'll ship your kits!